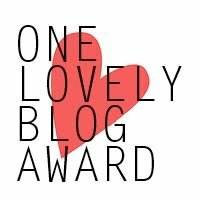 Melanie from http://luv4wickless.wordpress.com/about/ has recently nominated me for the One Lovely Blog Award. I was very honored that she considered Whimsey Pie and Wandrin’ Round worthy but I’m not sure if I can fulfill the requirements of the reward. These are: 1) Share seven things about myself; 2) Nominate 15 blogs that I admire; and 3) Contact those bloggers and let them know. The seven things about myself I can handle. Contacting the fifteen bloggers might be a problem. It’s not that I don’t read other blogs. I do – often. But I’m very random about it. My modus operandi is to go to Topics on the WordPress home page and pick tags that interest me (food, books, travel, photography, etc.) and just read the latest posts. Unfortunately, I don’t keep track of what lovely blogs I’ve wandered into and I’ve only recently started following other blogs. All that to say, I’ll do my best with the fifteen blogs but I make no promises. Regardless of how this turns out, I just want to thank Melanie for considering my blogs worthy of recognition. It’s always nice to receive positive feedback on something I really love doing. Thanks, Melanie! 2. I play the piano, mostly classical music. It is a huge stress reliever for me. 3. I am a night owl. Staying up late regularly interferes with my life but I can’t seem to help myself. 4. I drive too fast, although a recent speeding ticket seems to have lessened the urge just a bit. 5. I would love to learn to play the cello. 6. I love small, intimate concerts with gifted musicians. Recent experiences – Switchfoot, Straight No Chaser, Carbon Leaf, and their opening band Red Wanting Blue. I’m looking forward to seeing Lunasa, Booker T, and Michael Kaeshammer this summer. 7. I hate housework but I love a clean, tidy home. It’s quite a conundrum. Well, that’s a glimpse into my life and my blog indulgences. Each one is far more deserving of A Lovely Blog Award than me. I hope you enjoy these sites as much as I do. Happy Day! Thanks, Dave. We’ll be there in a few weeks. I can’t wait! I’m in desperate need of a vacation so being called a Zonie is something I’m looking forward to.